Port city Barcelona in Spain. Must-see destinations to make the most of a seven-hour stop off in Barcelona, Spain. • Visit the Sagrada Familia, Antoni Gaudi’s masterpiece, an opulent cathedral started in 1882 and still unfinished today. • The Gothic Quarter, or Barri Gotic, is the ancient heart of the city. Originally a Roman village, it is where locals and tourists throng to shop and eat and pray and stroll. 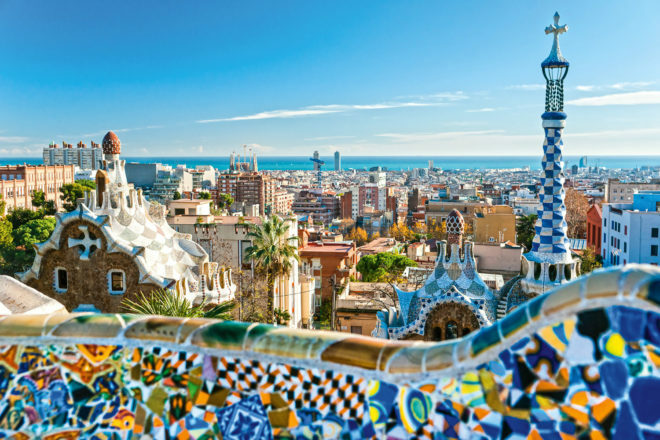 • Park Guell is another space stamped by the fantastical imagination of Gaudi; it is a park like no other, inhabited by weird and wonderful mosaic creatures and boasts gorgeous views of the city from the brightly tiled terrace. • Casa Batllo, another Gaudi wonder was built between 1904 and 1906 and is now a museum to his distinctive swirly, trippy style. • And for something not designed by Gaudi, the Picasso Museum celebrates the works of one of Spain’s most famous sons (who lived in Barcelona for a time) with a stunning and expansive collection of his works.